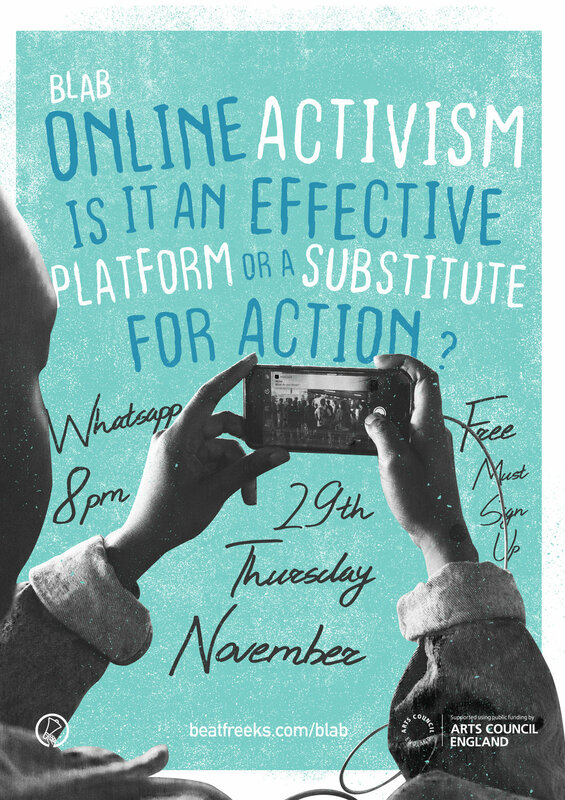 BLAB: Online Activism - Is It An Effective Platform Or A Substitute For Action? How significant is the role of the internet and social media in today's activism? You've seen online petitions, blogs, and twitter threads but how effective are they? We're going to be discussing all of this and more at BLAB: Online Activism - Is It An Effective Platform Or A Substitute For Action? on Thursday 29th November. But it's not without its twist. BLAB brings together young artists and activists with people on the cutting edge of relevant fields and goes beyond the tired panel discussion format to inspire debate and foster deeper connections, in irregular event locations, this BLAB will be taking place on Whatsapp. A Whatsapp group will be created on the evening of the event, we will invite three national and international speakers to contribute live to the Whatsapp conversation. This is an online-only event, you can join from wherever you are and be involved in the conversation. However, there will be a physical space at Beatfreeks HQ, Zellig, Digbeth for anyone who would like to discuss and continue the conversation. Be ready to be challenged, provoked and send your favourite GIFs. International & national speakers/Whatsapp-ers to be announced. Anybody added to the Whatsapp understands their personal number will be shared with those at the event. You shouldn’t be messaging outside of the event unless you have asked within the large public group. We will have multiple moderators in the group to ensure everyone is safe and well. We will be creating a physical space at Beatfreeks HQ for anyone who would like to talk and/or be in a space.